Jackpot Slots is much more than an elegant charge and sync dock, it transforms your iPhone or iPod touch into a casino-style slot machine. 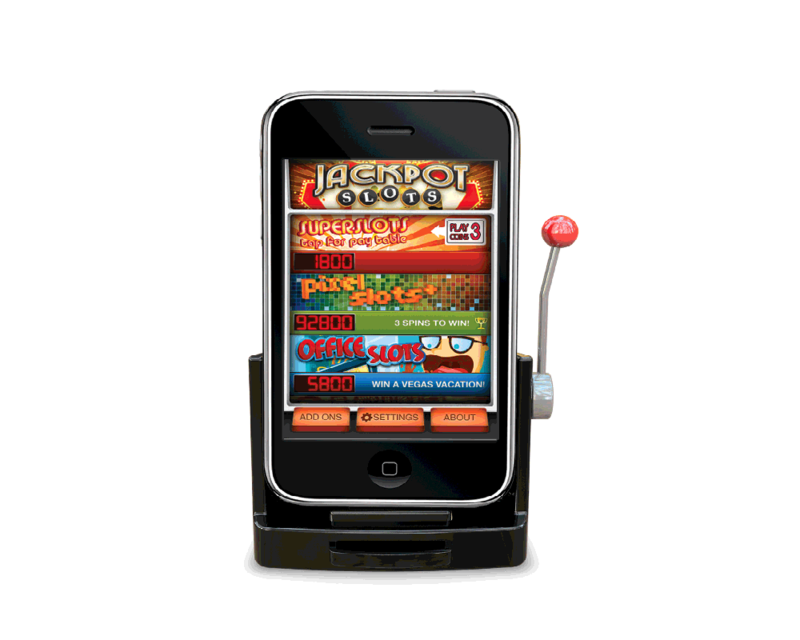 The Jackpot Slots charge and sync dock is the most realistic gaming experience your iPhone or iPod touch has ever known. Reel-spinning action like the world's finest casinos, multiple slot games, interactive one armed bandit action brings the excitement of Las Vegas to your iPhone and iPod touch. Connect the dock using the supplied USB charging cable to your AC charger or PC, then dock your device to keep it charging safe and secure in the dock. Pull the handle all the way forward to release your device from the dock when you are ready to travel. Jackpot slots is powered by your iPhone or iPod touch and uses virtually no power from your device so it can be used on the go without draining your battery. Connect to the Jackpot Slots dock using your device's 30-Pin Connector. Charge and sync to your computer using the included USB cable. Dazzlingly real gaming experience! Different slots of varying levels of difficulty to challenge your skills. Play the Jackpot Slots game and accumulate credits to unlock other Slot Machines in the app. Amazing functionality as a desktop charge and sync dock; your device will always be ready to go!